Essential Judicial Reasoning is a compilation of judicial pronouncements dealing with practice and procedure and the assessment of evidence. A judicial officer is, on a daily basis, required to decide on issues of practice and procedure and assess evidence. In deciding these issues and assessing the evidence, the judicial officer is required to know the reasoning process relevant to the situation, as established by the case law. 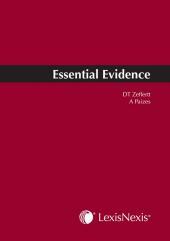 Essential Judicial Reasoning provides a quick reference to useful judicial pronouncements giving the reader direct access to 20 years' experience on the bench. It is a guide to difficult problems that can often arise unexpectedly in court and is essential for judicial officers, advocates and attorneys. I found the book very useful, and I relied on it extensively in dealing with the cases I presided over and for the preparation of my judgments during my most recent acting stint from 1 February 2017 to 3 March 2017. Challenge to constitutionality of provision in statute after judgment of court of first instance not permissible. Assessment of the evidence of a witness, which is not contradicted. The nature of expert evidence and how it is to be assessed. Assessment of a child's evidence. Impartial judge: the test for recusal. Management of trial by judicial officer. Rectification of final order by court. Extended meaning of vexatious proceedings: effect on costs. Contempt of court by non-compliance with court order. Spurious disputes of fact: â€˜robust approach' necessary.